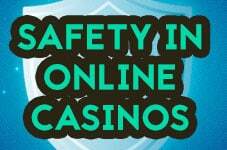 One of the most important things about online casinos is their safety. If you want to play in online casinos, then you definitely don’t want your account hacked. And this is something that happens far too frequently for our liking. You can prevent this by learning more about the safety of the casino. So, what are the things that you need to look out for? The casino license is arguably the most important thing that you need to notice. There are different license-issuing bodies around the world. The most well-known are the United Kingdom Gambling Commission, the Malta Gambling Authority, and others. So, if you want to know if a casino is safe, look for its licenses. If it has a license issued from a respected body, then it’s most likely legit. There ought to be encryption technology installed on the platform. The casinos usually use 128bit encryption technology. This keeps things safe for the players. So, you wouldn’t need to worry at all about the casino being unsafe. You can feel free in depositing your money on the platform that has encryption technology. The best and safest online casinos are frequently tested. Independent testing agencies take the brunt of the work here. They test the safety of the games. If anyone has ever tampered with the RNG rates of the games, then the testing agencies won’t issue a certificate. This is a very important thing to know. If you find the eCOGRA certificate stamp, then it means that the games are legit. If you learn more about these things, then you can feel safe in knowing that the casino is safe. And you can continue to have a great gambling experience on the online gambling platform. Read more news at CasinoViking Blog to learn more about casino related news and articles. Play safe!